It is the brief hour of twilight that characterises the northern summer nights. I have just arrived next to a little pond at the edge of a forest, connected to a ditch. 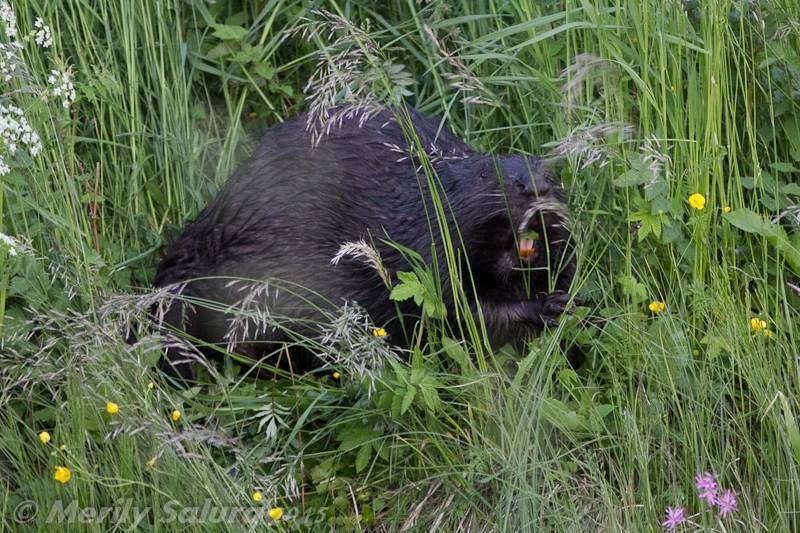 In the midst of the lively sounds of a late June evening, I hear hungry, almost aggressive munching. It is coming from the side of the ditch. “Munch-munch-munch,” and the juicy leaves and branches of raspberries disappear behind a set of reddish-orange teeth. I try not to laugh at the lovely sound. The beaver is here. My visits to the beaver lodge are divided into beaver-evenings and non-beaver-evenings. That is to say, sometimes the animals dine here, sometimes – probably somewhere else, and I have not figured out the schedule according to which they choose the place for dinner. There is no guarantee. 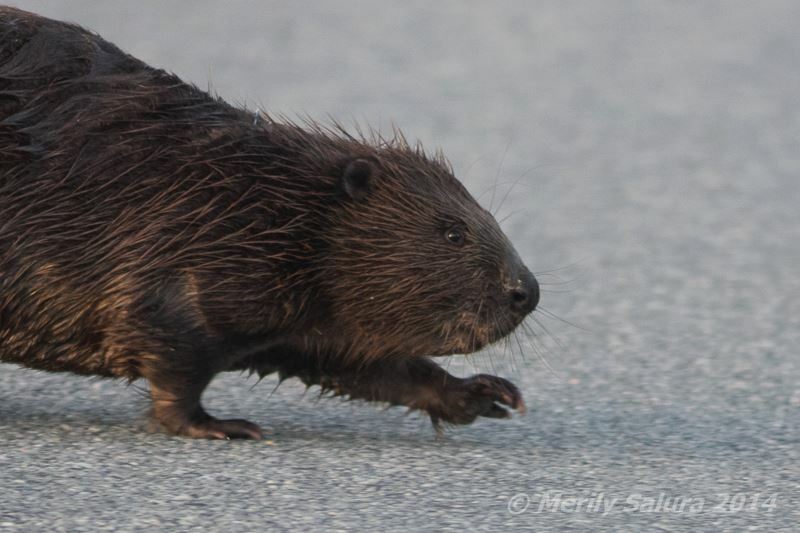 This makes the thrill of yet another “beaver-evening” all the greater, as I get to see how the biggest rodent of Estonia (also, second biggest in the world, with capybara holding the first place) clumsily struts out of the hiding shield of raspberry plants and descends into water. It swims around in the pond, using its hinder legs as fins, and tail as the rudder. The tail is important for yet another reason. Namely, it has the central role in delivering a warning signal to other nearby beavers by making a loud splash in the case of danger. Today there is no splash, as it should be. The beaver seems to be out alone tonight, and sooner than I expect, it is already back on the dry land, leaning up to a birch tree, and hungrily peeling it bit by bit. Then the beaver starts to comb its fur. It is an expected sight, as beavers spend just as much time on hygiene and “hair-dressing” as they do on finding and eating food. This is one of the particular traits of beavers – the claw of the second toe of the hinder leg is split, called the combing claw. There would be lots to tell about the combing claw – in case of heightened curiosity, you could even find scientific articles about the beaver’s combing claw in JStor. Yes, I mentioned reddish-orange teeth, contrary to the toothpaste advertisement. The orange enamel is an indicator of the beavers’ diet: they are vegetarians who mostly prefer the bark of fast-growing trees, leaves, roots, water plants, buds, and twigs. Beavers have a weakness for birch, aspen, and willow (trees which are quite common in Estonia), and raspberry plants, nettles, thatch, dropwort, etc. The hard, protective enamel of their teeth is a sign of high concentration of iron in the food. Given that information, beaver observers’ hopes should be highest in areas where birches, aspens, willows, and beavers’ favourite plants could be found. 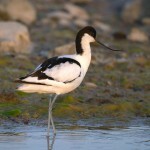 It is also good to know that they prefer to live in water bodies with a slower flow of water. Beavers raise their kids in a monogamous arrangement. Mating period takes place usually in the end of February and/or in the beginning of March. 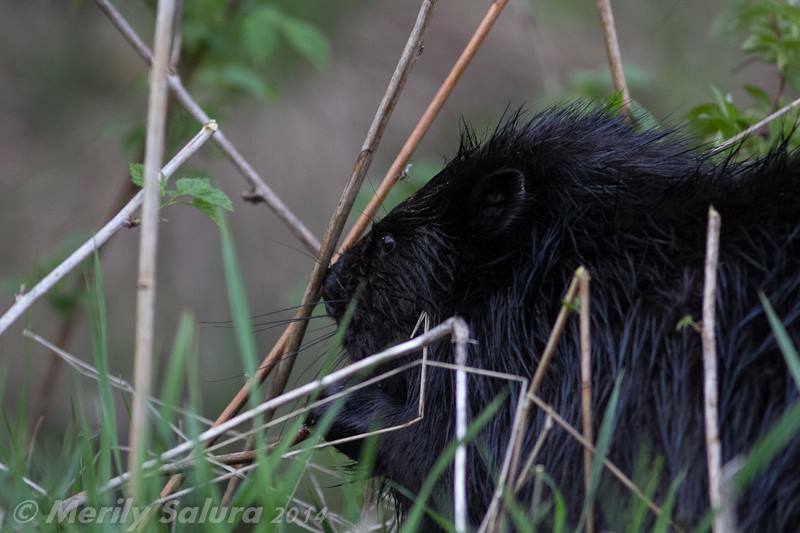 The offspring is born in the end of May, beginning of June, and from then on, the male beaver and last year’s offspring use other chambers and tunnels in the lodge than the one where the female resides with the young ones. 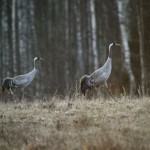 There are always at least two years’ offspring growing up together in the lodge. Young beavers reach sexual maturity at two years of age; there is usually one breeding female in the family of the lodge. A brownish creature, small but agile, was swimming downriver, past me, until it got out of sight. I waited, and the excitement of an unexpected encounter made it difficult not to move. I eyed the water, until I saw the familiar figure returning from behind the curve. It swam closer, oblivious of my presence, carrying a young branch with lush juicy-looking leaves between its teeth. My eyes followed the little beaver, as it disappeared from sight the same way it had appeared. Like a little boat. I caught myself idly wondering if the parents ordered the kid to bring dinner. A disciplined home for sure. 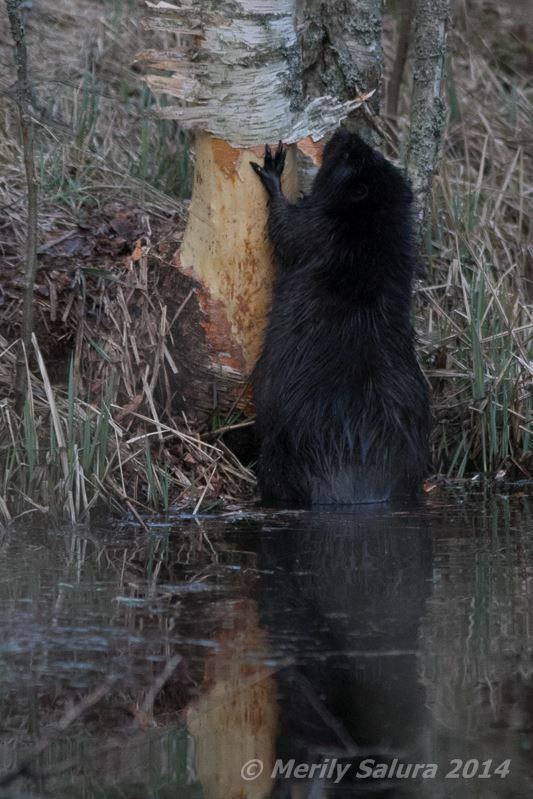 The best time for beaver photography would be definitely the end of February and the beginning of March; as it is the mating period, beavers get especially active during that time, and start to mark their territories. The chances for encountering a beaver are then all the greater, as the food resources of the winter are running low and the animals also tend to go out during the daytime, in search of food, writes Nikolai Laanetu in “Eesti Loodus”(2005/2). 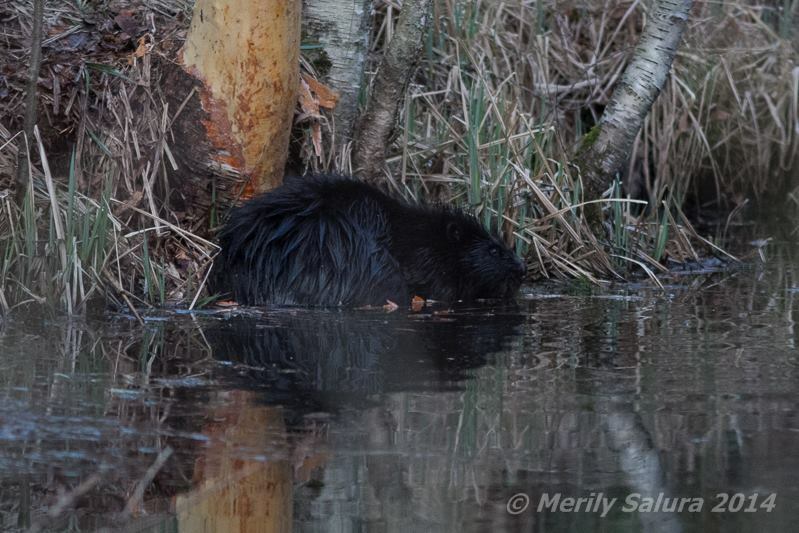 Beaver photography, as wildlife photography in general, takes luck and skill, and returns unforgettable moments with fascinating creatures. By having spent time with different beaver families, I have seen various gripping stories unfold in front of my eyes, and formed a contact with the animals and their habitat. Have respect and patience, lots of luck and some determination on this (beaver) path. 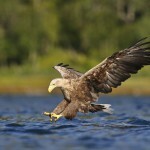 This entry was posted in CUSTOM WILDERNESS TOURS, GAME WATCHING, PHOTO SAFARI. Bookmark the permalink.